This morning I was browsing through blogs on retirement as I am wont to do lately (yes, I am a planner), and I came across this interesting blog, Sightings Over Sixty, written by Tom Sightings. I read through the blogger's most recent post, Let's Pick a President, and then I started reading some of his most popular posts. I did his handy quiz to determine whether I am ready for retirement, and discovered that no, I am woefully uninformed and therefore not ready for retirement. Hmm. Then Tom goes on to imagine how he would feel about the Baby Boomer generation if he were a Gen X'er or Millennial. What was especially interesting about this post were the comments that he received -- 57 of them -- from both Boomers and younger generations. I was surprised by the level of vitriol and blame directed toward the Boomer generation by Gen X'ers and Millennials, who expressed the beliefs that the Baby Boomer generation were horrible parents; that they have made the world a worse place; that they have sold their children down the river economically; and that they have an unpleasant sense of entitlement. Many of the Boomers writing comments told their personal stories of struggle and hardship that contrasted with the rosy generalizations about Boomers' lives claimed by the younger folks. As I read the 57 comments, I thought about my own life and choices as a middle-of-the pack Boomer, and those of other Boomers I know, and the challenges faced by my kids, all of whom are Millennials. I'd like to say some things about choices, my own story, and the legacy of the Baby Boomers. Some of these thoughts might have to wait for a separate post on the matter. I am writing, of course, with a Canadian perspective on the topic, which is a little different perhaps than those of the blogger and commenters. First of all, I remember that when I was a young person, I was very unhappy with the state of the world that had been created by my parents' generation and the generation that preceded them. Perhaps this attitude is typical for young people with critical minds and a desire to make the world a better place. I grew up during the Cold War, with the threat of nuclear annihilation always at the back of our minds. We did bomb drills in school when I was in primary school. Information about the horrors of the Holocaust was being released in dribs and drabs, and it was fresh and raw, and disturbing beyond belief. The northern rural part of Canada where I lived saw many American back-to-the-landers moving in to escape the Viet Nam war, as well as a number of wealthy Americans buying a second property in our remote location, just in case a Third World War did occur. In the world in which I came of age, there was rampant racism, and in our area it was mostly directed toward Aboriginal people. There were limited opportunities for women, and although the feminist movement had begun elsewhere, everything in our little town was ten years behind the times. I was lucky that my parents believed in education and encouraged me in my aspiration to go to university, even though neither of them had been able to attend university themselves. In the the world of my youth, the environment was under assault. I lived in a world of DDT, and PCBs, huge dam projects, and clear cut forests. Before I was out of my teens, I was already an environmental activist. I also argued for women's rights, and civil rights, and ending poverty by distributing wealth more equitably. I believed that big money and corporations were a source of many of the world's problems (a belief that I still hold). As a woman, I fought for the right to have a career. I was among the first generation of of women to "have it all" -- a career, a marriage, and children. It was hard. When I look back now, I don't know where I found the energy. There were some Baby Boomers who easily slid into well-paying jobs and amassed considerable material wealth. This particularly was the case for leading edge Boomers, those born just after the war, who had many job opportunities. The economy grew after the war and as many men were lost in the war and women were back in the homes raising families, young Boomers (mostly men) filled the job openings. By the time I had finished my Bachelor's degree at the end of the seventies, jobs were scarce. My two youngest brothers born in 1960 and 1962 were at the tail end of the boom, and had an even greater struggle to find jobs. My hard-working parents lost their business and almost lost their house during the inflationary spiral of 1981-82. They lived a very frugal life when they were in their sixties as they tried to pay back their debts. I and my siblings helped them financially during those tough years. They both ended up working into their seventies because they had to. I worked my way through university, living below the poverty line for seven years as I completed a Bachelor's degree and then a graduate degree. I made the pragmatic choice to study a professional field in which I knew that there were many job opportunities. I landed a job in a city far from home, and slowly began to pay back my student loans and save for a down payment on a house. Our first house was an inexpensive old two-bedroom house in a shabby inner city neighbourhood. Later, I went back to school again and completed another graduate degree. My first husband passed away at a young age, when my children ranged in age from 8 to not quite 2. I was in the probationary phase of a new job at the time. I raised my children as a single mom while working full time. I was fortunate to have a good job that I loved. However, just about every penny that I earned went to child care, the mortgage, and other expenses for quite a few years. Also, the pension plan was not very good. So I scrimped and saved, putting money away into an RRSP (the Canadian equivalent of a 401), and also into education savings accounts for each of my kids so that they would be able to pursue a post secondary education. All three of them have attended university and completed degrees. As a Baby Boomer, I did not have an easy life, nor did money and jobs come easily. I have always worked very hard and also worked long hours. I realize that this is just my story, and it does not necessarily reflect the whole generational cohort. I am concerned about the world that we are leaving for our children and grandchildren. My bright, capable, hard-working children have struggled to find meaningful work that pays a living wage. We Boomers might have helped to improve some things (for example: opportunities for women, more recognition of racism and the development of policies and programs that foster inclusive approaches, more supportive perspectives about sexual orientation, bans of DDT and PCBs, the requirement of consultation and environmental review for large scale projects like dams and pipelines), but we are leaving other things in a mess. The corporations and the very wealthy still have an inordinate amount of control, and their approaches are dominated by profit, not by civic duty or social justice. We are on the brink of a global climate change disaster that is resulting in extreme weather events that impact the poor disproportionately, and that will make the world uninhabitable for humans and many animals if we don't act decisively and soon. Animal species are becoming extinct and the oceans are filling with plastics and pollution. Politically, across the world, we seem to be moving toward an group mentality of anti-intellectualism that discounts reason and expert analysis, and favours fear-mongering and finger-pointing instead. I am worried. I am putting tremendous hope in the Gen X'ers, Millennials, and Gen Z's to make the world a better place. Many of us Baby Boomers who are still around will be there helping. Last month in May, and again this month, I have participated in an en plein air event hosted by our local university. The paint out was held at a rural heritage property, The Coutts Centre, and attracted artists from cities and towns in every direction. The Coutts Centre is an oasis in the middle of the prairies. 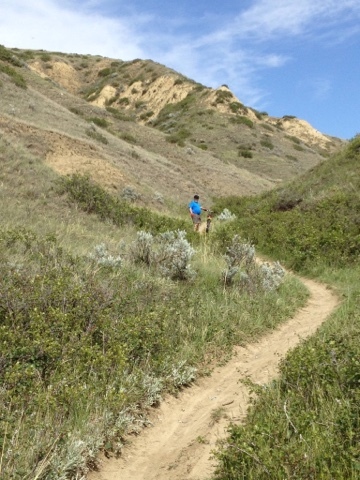 It is located in an area of low rolling hills and affords a vista of the Rocky Mountains in the distance. There are several heritage style barns and outbuildings, and a couple of picturesque low wooden houses. 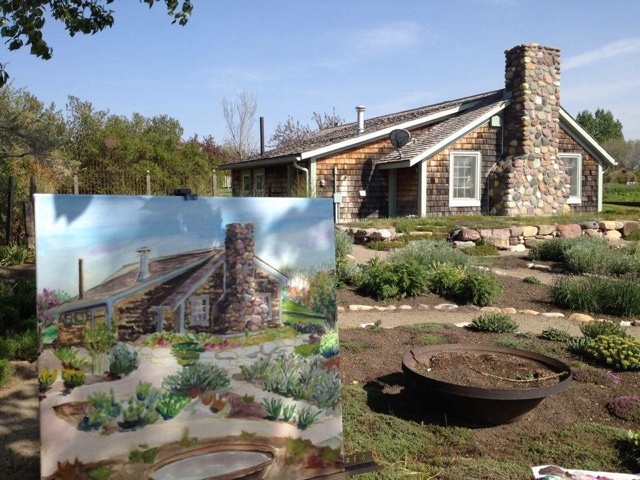 The property is especially known for its extensive gardens: flower gardens, a herb garden, vegetable and berry gardens, a rose garden, and a garden of natural prairie grasses. There are woods with little hidden nooks, fruit trees, a pond, rock walls, a patio, and many art sculptures throughout the property. In short, it is a painter's paradise. I am not an experienced plein air painter. Although I began oil painting as a teenager, and have painted from time to time ever since then with multi-year breaks in between, I have only attempted to paint en plein air, outside on location, a few times. So when I signed up for these two paint outs, it was with feelings of both excitement and trepidation. I felt excitement because it is intensely pleasurable to be standing in the landscape painting it - a very different experience than painting in studio. It was also a chance to meet some of the other artists who live in my region and see their work in progress. 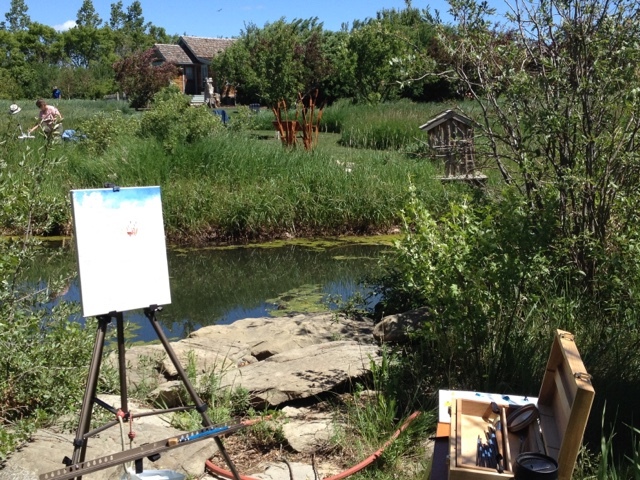 At the same time, I felt a certain level of trepidation, because plein air painting is difficult: the wind, the bugs, the shifting light, and the way the paint colours look different out in the sun, and how the paint dries so fast. 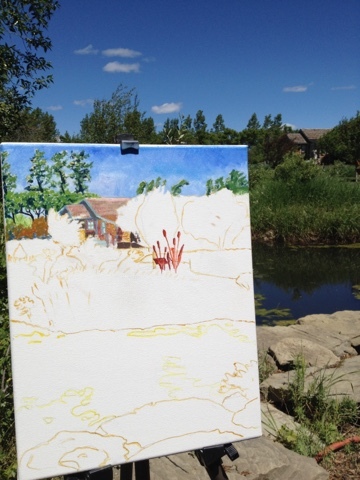 This photo below shows my plein air painting in progress at the May paint out. Last weekend, I went to the Coutts Centre for another paint out. I chatted with a number of artists who had been there the previous month, as well as some new folks. It was interesting to see the array of styles and strategies. Although plein air painting is challenging, I have found that I really love it. In my upcoming period of leave from work, I am going to try to do some plein air painting. There are many beautiful locations near where I live, and also we will be travelling this summer. I would like to find some painting companions near home. Maybe I will sign up for another organized event. My husband Rob likes to describe himself as the poster boy for happy retirement. He retired more than ten years ago, as soon as he qualified for retirement at his workplace, and has never looked back. He truly is a shining example of someone who has achieved a satisfying retirement lifestyle. Biking up a big hill. As I muse about and begin to plan my own retirement timing and process, I have been quizzing Rob about how he made the decision to retire when he did, and whether he felt anxious about it. I didn't know him then; we didn't get together until nearly two years after he retired. He tells me that, unlike me, he had no angst about retiring. He was delighted to retire, and has fully embraced and enjoyed the retirement lifestyle ever since. He has never missed his workplace, even though he worked for the same company for more than thirty years. He often tells stories about people and past events at work, but his main orientation is to the present. There are a number of ways in which Rob and his situation are different from me and my circumstances. For one thing, Rob saw his employment as "work to live" whereas my approach can be described as "live to work." Rob worked in the transportation industry, and his job, although it came with responsibilities and safety concerns, was not highly stimulating. His job did not help him self actualize or define his identity, but rather took time away from the pursuits that were his main interests. When he had an opportunity, he did take on special roles, like shop steward for the union, and health and safety representative. But for the most part, boredom was the defining feature of his job. In contrast, although I have a rich and satisfying life outside of work, for most of my career, my job also has been something I have greatly enjoyed. My most recent position has been an exception to this, but in previous years, my job has been so interesting and fulfilling, and such a big part of my identity, that I would have chosen to do certain parts of it even if I was not getting paid. In some ways, it has been the dream job, and I know I have been very lucky. But the very long hours my work has demanded have been problematic and stressful, especially during my most recent administrative role. Another way in which Rob and I are different is in our characteristic approach to life. Rob lives in the present, enjoys life as it unfolds, and handles troubles as they emerge, whereas I am a planner. I plan our holidays, our visits to friends and family, and the events of our weekends. I have spent a lot of time thinking about and planning each life transition, such as moves, new jobs, and becoming grandparents. I also plan in order to forestall certain predictable troubles - e.g., financial planning. So I suppose it is not surprising that when Rob hit retirement age just at the same time that his daughter graduated from university, it seemed obvious to him that he should take early retirement. He recognized that his work was hard on his health, and he knew he could afford to retire. So why not? In contrast, I am thinking it through from every angle. Will we be financially secure? Where will we live? What are the advantages and disadvantages of retiring soon, retiring gradually, or postponing the whole thing for awhile? Have I finished with my career, or will I keep a hand in it? What will I do after I retire, and what will we do together? Of course, I know that I will love retirement. I will have more time to spend with our grandkids, with friends, and with Rob. I have writing and art projects that I have been deferring for too long. I want to travel, and do more skiing, hiking, camping, gardening, and so forth. I want to become more active in the community. Really, all I have to do is look at Rob and how much he enjoys his time as a retiree to know that retirement will be great, and we will enjoy our time together.